While the chickens on evil Mrs. Tweedy's farm dream of a better life, a clever hen named Ginger is hatching plans to fly the coop - for good! The only problem is, chickens can't fly...or can they? 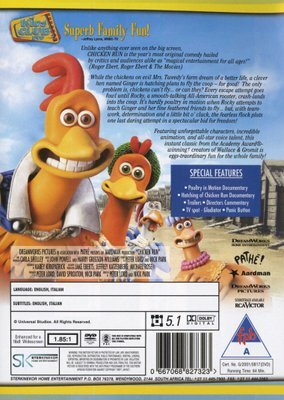 Every escape attempt goes fowl until Rocky, a smooth talking All-American rooster, crash-lands into the coop. 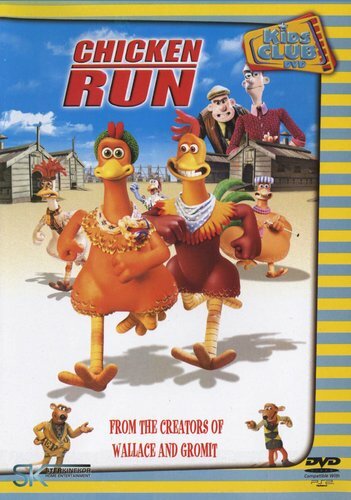 It's hardly poultry in motion when Rocky attempts to teach Ginger and her fine feathered friends to fly...but, with teamwork, determination and a little bit o'cluck, the fearless flock plots one last daring attempt in a spectacular bid for freedom! Featuring unforgettable characters, incredible animation, and all-star voice talent, this instant classic from Academy Award winning creators of Wallace & Gromit is eggs-traordinary fun for the whole family! This Beitish bit of fun is the highest grossing stop-animation movie ever made! And if this doesn't whet your appetite to see it as a matter of priority: the notice on the DVD box proudly announce it as being: “From the creators of 'Wallace and Gromet,'” which virtually says it all – so you know you're in for 84 minutes of some of the best Brish humour ever offered; much of it being very subtle indeed! The voices include those of Julia Salwalha and Mel Gibson. While the picture never won an actual Oscar, it did secure many other international awards. Such a pity that audiences in years to come will never have seen films like “The Great Eascape;” or know who the likes of Steve McQueen and Willaim Holden were. This one satirises mainly “The Great Escape, but “Starlag 17;” “Albert R.N.” and even “Flight of the Phoenix,” haven't escaped the scriptwriters' satirical wit. Story: middle-aged couple, Mr and Mrs Tweedy (Tay Hargarth and Miranda Richardson) own an egg farm “somewhere in Yorkshire, England.” This farm is run very much along the lines of a WWII prisonere-of-war camp, each chicken being accountable for the number eggs she lays every day! Alas, the cantankerous owners become aware of the fact that there is more money to be made from chicken pies than they are presently earning from the sale of eggs. One chicken, Ginger, (Julia Salwahla) is regarded by the others as their leader, and gets wind of this new development – especially with the sudden excessive feeding to fatten up the hens. She figures that the only way out of the farm is “over the fence,” and she frequently winds up in solitary confinement – actually the coal-cellar – for her many abortive attempts to set everyone free. Enter Rocky, an American Rhode Island Red rooster(Mel Gibson.) He smooth-talks the hens into believing that he alone can help the escape. He finds a strange ally in Fowler (Benjamin Withrow), who is forever boasting about his old-time RAF feats. Of course, against all odds, the film ends happily for all. In the final scene, we see the two spiv-like rats (Timothy Spall and Phil Daniels) arguing seriously as to which came first; the chicken or the egg?!! One cannot rate this picture too highly! As the advertising says: This is NOT a chick flick!